Nutmeg, while not a type of nut, is the seed of Myrista fragrans, a tree that grows in Indonesia. The seed is covered with a skin known as mace which, like nutmeg, is also used as a spice. Although strongly associated in the West with holiday treats like pumpkin pie and eggnog, nutmeg has a medicinal use — particularly in the East, where it is used for toothache, infection, asthma, and rheumatic pain. In traditional Chinese and Arab medicine, nutmeg is used to treat gastrointestinal disease, including diarrhea. Recent research has shown that nutmeg helps with disordered lipids, elevated blood glucose, heart tissue damage and liver toxicity. A water extract of nutmeg seeds has been shown to suppress the growth of human colon cancer cells and reduced tumor growth in mice that received transplanted lung cancer cells. 14 The researchers found that nutmeg inhibited cancer growth and cancer metabolism by inhibiting the activity of a key enzyme responsible for cancer metabolism regulation known as lactate dehydrogenase. In a mouse model of colon cancer, nutmeg reduced the formation of intestinal tumors. In this animal model, nutmeg attenuated the levels of uremic toxins, which are likely produced by the gut microbiota, and decreased intestinal tumorigenesis. 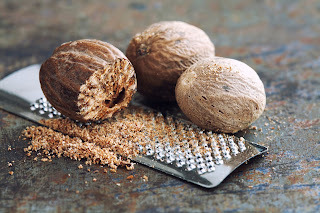 Researchers from China recently studied nutmeg’s liver-protective effects.16 They found that nutmeg extract protected against liver damage induced by a toxic compound in mice, as revealed by recovery of liver enzymes, and less oxidative stress and inflammation in the liver. Gene expression analysis determined that the protective effect was the result of modulation of the peroxisome proliferator-activated receptor alpha (PPAR alpha), which regulates the transcription of genes involved in fatty acid oxidation and transport. The researchers discovered that myrislignan, a neolignane in nutmeg, was also significantly protective against liver injury. Will Nutmeg Become a Drug? Janssens J et al. J Ethnopharmacol. 1990 May;29(2):179-88. Zhang WK et al. Food Nutr Res. 2016 Apr 26;60:30849. Zhang CR et al. Nat Prod Commun. 2015 Aug;10(8):1399-402. Xiong R et al. Biomed Pharmacother. 2018 Feb;98:834-846. Iyer M et al. J Indian Prosthodont Soc. 2017 Jul-Sep;17(3):267-272. Vimal A et al. 3 Biotech. 2017 Aug;7(4):258. Park JY et al. Bioorg Med Chem Lett. 2017 Jul 15;27(14):3060-3064. Shafiei Z et al. Evid Based Complement Alternat Med. 2012;2012:825362. Wu N et al. Molecules. 2016 Jan 22;21(2):134. Kiyofuji K et al. Eur J Pharmacol. 2015 Aug 5;760:129-35. Plaingam W et al. J Tradit Complement Med. 2017 Jun 15;7(4):538-552. Zhao Q et al. Mol Med Rep. 2017 Apr;15(4):2280-2288. Cuong TD et al. Nat Prod Commun. 2014 Apr;9(4):499-502. Kim EY et al. Am J Chin Med. 2016;44(5):1063-79. Li F et al. J Proteome Res. 2015 Apr 3;14(4):1937-46. Yang XN et al. J Proteome Res. 2018, 17(5):1887-1897. Song JS et al. Toxicol Appl Pharmacol. 2016 Sep 15;307:138-149. Choi DG et al. Pharmazie. 2015 Nov;70(11):733-9. Abourashed EA et al. Phytochem Rev. 2016 Dec;15(6):1035-1056.